We buy brand names because we associate them with excellence and while this may be true for most brands, it does not necessarily mean that other products cannot deliver the same results at a much more affordable price. Take Blue Wave for example, a pool pump built to serve above ground pools in a cost efficient manner, which delivers amazing results when used on all types and sizes of above ground pools. Do not limit yourself to the brand names and forego a chance to achieve high performance from a pool pump in a cost effective way. Check out the features that this pool pump has to offer. The basket availed for the collection of debris is quite big and can collect dirt for a number of cleanings before it is time for it to be emptied. The cover used for the basket is clear and this allows you to have a look at the amount of dirt accumulated. It is also quite easy to open up the strainer through the use of two knobs on the lid, eliminating the need for tools to get the lid open. This pump has been built with a polymer that can resist corrosion, enabling the pump to last for long. The motor is cooled during operation by the use of air vents which allow air entry into the motor’s working parts. The air circulates around the motor, enabling the environment to stay cool to prevent an instance of overheating which could be damaging to the pump. The motor has also been constructed with corrosion resistant material which makes the pump safe for use in the outdoors and in all weather conditions. The operation of this pump is quite efficient and so quiet that you probably won’t notice as it pumps water right next to you. 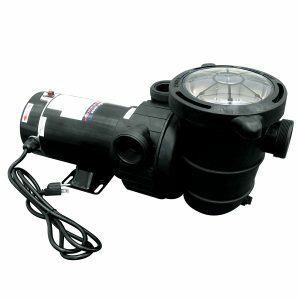 This pump has a range of horsepower options between 1 and 1.5, which allows you to choose what works best for your pool, given its size as well as the amount of energy that you wish to consume. With this kind of a pump, you can decide on whether you prefer a vertical or a horizontal discharge based on your setup. 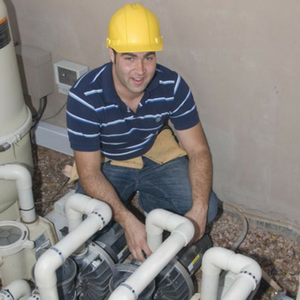 The pump works efficiently with most systems as it can easily fit most filter systems. It operates at a hundred and ten volts and it comes with a plug that is six feet long such that you do not have to purchase a plug. This pool pump has a self-priming action which allows you to set it up quite easily.